Background: Breast lumpectomy is an integral part of the treatment of mammary masses in women. This study was conducted to evaluate and compare two-drug combinations of propofol–ketamine (PK) (ketofol) and propofol–fentanyl (PF) (fenofol) on quality of sedation and analgesia in lumpectomy. Materials and Methods: This was a randomized, double-blind, clinical trial performed on 64 patients aged 15–70 years with breast cancer lumpectomy referred to Isfahan's Seyed Al-Shohada Hospital. Consequently, patients were divided into two groups of 32 patients, each group receiving PF combination or PK combination during anesthesia. Results: The patients in two groups, PF and PK, were compared in their sedation levels, severity of pain, and other variables. The mean arterial blood pressure, systolic blood pressure, and heart rate (HR) did not show any significant difference at the beginning of the study in the two groups, but the fenofol (PF) group had a significantly lower oxygen saturation than the ketofol (PK) group. 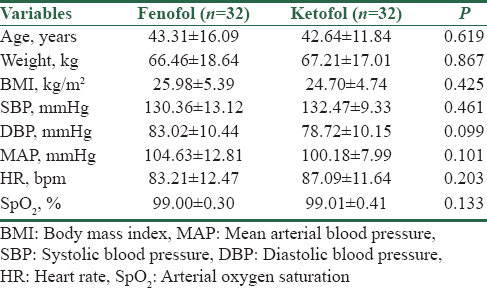 The sedation level was significantly lower in the fenofol group than the ketofol group (P < 0.001). The mean pain intensity was significantly lower in the PF group than the PK group (P < 0.001). Conclusion: The two combinations of ketofol and fenofol cause rapid, favorable, safe anesthetic with minimal side effects and hemodynamic effects but it may be a superior alternative to fenofol combination, in terms of respiratory depression. Mammillary mass reduction or lumpectomy is an inseparable part of the medical procedure of mammillary masses in women. Based on the necessary time of operating, it is essential to use drugs or mixture of them to have lasting effect according to procedure with least hemodynamic changes, and middle procedure and recovery time side effects in addition to effective settlement of anxiety and pain in patient., An ideal sedative must have not only quick starting effect and suitable recovery period but also adequate lenity and analgesic effect and cause proper cardiovascular and respiratory function, oblivion, and stillness., Unfortunately, no specified matter that comprises all these features is not existed, and physicians have to use the mixture of some different drugs with changeable doses for reaching these goals. Propofol is a short-acting, sedative, intravenous, anesthetic drug that is used in induction and maintenance of anesthesia in adults and children. In recent years, propofol has become famous because of quick and deep induction and its short effecting time period for emergency unit and processing sedation and analgesia.,,, By the way, propofol causes dose-dependent respiratory depression and probably temporarily blood pressure falling in some patients. Propofol as a strong anesthetic has no property of internal analgesia; so a quick action opioid like fentanyl is usually used for helping in analgesia. Using opioid with propofol drug reduces the essential dose amount, but it increases the respiratory depression., Ketamine is a sedative and analgesic drug that can be used for analgesia alone or with others drugs., Formerly, Ketamine was the only safe and effective anesthetic drug that has rare limitations such as recovery delay, emergency uses, and nausea and vomiting. Ketamine does not cause the respiratory depression, and it raises the blood pressure and heartbeat with sympathetic stimulation. A number of studies showed that the combination of ketamine and propofol (ketofol) is effective and safe for sedation. Mixing these two drugs leads to reduction of side effects and quick recovery. Fame of fentanyl as an analgesic drug in operations is rather obligated by cardiovascular stability that causes in patients with high malignant condition. Fentanyl in combination with propofol leads to analgesia and more quick recovery and less side effects. Theoretically, ketamine and propofol combination just like fentanyl and propofol combination can cause dose reduction. Nowadays, different combinations are used to do anesthesia and so far there was no study on the effectiveness of two-drug combinations of propofol–ketamine (PK) and propofol–fentanyl (PF) in comparing anesthesia with spontaneous respiration in middle of doing lumpectomy in these patients, so we decided to compare the effectiveness of these two-drug combination in anesthesia of patients under mammillary lumpectomy. The present study is a double-blind clinical trial that was performed on 64 patients with breast lumpectomy referred to Isfahan Seyed Al-Shohada Hospital during 2016–17. It has been registered in www.irct.ir with the code of IRCT20160812029310N4. All the patients aged 15–70 years with breast cancer lumpectomy referred to Isfahan's Seyed Al-Shohada Hospital have been enrolled for the study if they had the American Society of Anesthesiologists (ASA) physical status of two or less. The patients were aged between 15 and 70 years and had breast mass with ASA III physical status as candidates for lumpectomy were included, and the patients with severe allergies, unstable medical condition, difficult breathing, mental illness, pregnancy, aged more than 70 years, head injuries, increased intraocular pressure or intracranial pressure, cardiovascular diseases, respiratory diseases, liver disease, epilepsy or a history of seizure, neurological disorder, tumor or metastasis of the brain, the use of any analgesic drug, and chronic pain syndromes were excluded from the study. The patients who needed to have endotracheal intubation and those who had cardiopulmonary arrest were also excluded from the study. After obtaining approval from the Research Committee of the Isfahan University of Medical Sciences and obtaining written consent from all patients, at the onset of the study (before surgery), we recorded their demographic and clinical data including age, weight, blood pressure, heart rate (HR), and oxygen saturation (SPO2). Subsequently, they were randomly divided into two groups using Allocation software. Based on the sample size formula, 64 patients with breast lumpectomy were selected at 95% confidence level and the test power of 80%. In the first group, the patients received 1 μg/kg of fentanyl with propofol at a dose of 1 mg/kg as a bolus intravenous dose, while in the second group, the patients received 0.5 mg/kg of ketamine plus propofol 1 mg/kg in the form of bolus intravenous dose. In this double-blind study, the person who recorded the data and the patient was unaware of both the type of the drug prescribed and the group the patient was placed in. Within and after operation, factors such as mean arterial blood pressure (MAP), systolic blood pressure (SBP), diastolic blood ressure (DBP), HR, and arterial SPO2 were recorded. Patients' pain intensity was also recorded on the basis of visual analog scale scoring system. Furthermore, the sedation score of patients were recorded on the basis of Ramsay's criterion, and postoperative complications such as restlessness, shortness of breath, nausea, vomiting, coughing, and others were recorded. If the patient's pain score was more than 3, 20 mg pethidine was prescribed (no patient, fortunately, received an additional dose of the drug). Finally, the collected data were entered into SPSS software version 22 South (Wacker Drive, 11th Floor, Chicago, IL 60606-6412). The results of the Kolmogorov–Smirnov test indicated that the data had normal distribution. To compare the mean of quantitative variables between the two groups, independent t-test was run. Furthermore, to compare the frequency distribution of qualitative variables, Fisher's exact test was used. For the comparison of the mean of quantitative variables with time (before, during, and after operation) in each of the two groups, analysis of variance with repeated observations was used. It should be noted that in all analyses, the significance level was considered to be <0.05. The present study was performed on 32 patients in the fenofol group with the mean age of 43.31 ± 16.09 years and 32 patients in the ketofol group with the mean age of 42.64 ± 11.84 years. The two groups were similar in terms of age, weight, body mass index, and clinical factors including blood pressure, HR, and arterial SPO2 (P > 0.05) [Table 1]. The MAP in the fenofol group before surgery was 104.63 ± 12.81, which decreased to 91.69 ± 9.30 during operation and increased to 97.96 ± 21.96 in the postoperative period. It can be said that the changes in MAP over time were statistically significant in the fenofol group (P = 0.003); however, in the ketofol group, such change was negligible and insignificant (P = 0.083). 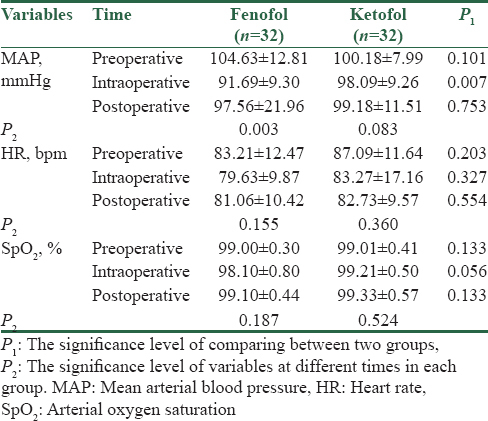 In addition, the MAP status of patients during operation in the fenofol group with the mean of 91.69 ± 9.30 was significantly lower than that in the ketofol group with a mean of 91.69 ± 9.26 (P = 0.007); however, in the postoperative status, the MAP status of both groups was evaluated as the same (P > 0.05). On the other hand, HR and arterial SPO2 were not significantly different between the two groups as well as in each of the two groups over time (before, during, and after the operation) (P > 0.05) [Table 2]. The evaluation of the pain score and the level of sedation of the patients in the two groups also showed that the pain score and sedation level of the patients in the fenofol group with the mean values of 4.8 ± 1.53 and 5.38 ± 0.87, respectively, were significantly lower than those in the ketofol group with a mean of 5.41 ± 4.15 and 6.00 ± 0.01, respectively (P < 0.05) [Table 3]. Eventually, 4 (12.5%) cases of complication were observed in the fenofol group; 2 (6.3%) cases had skin hives, 1 (3.1%) case had cough, and 1 (3.1%) case had dyspnea. Furthermore, in the ketofol group, 6 (18.7%) cases of complication were observed; one (3.1%) case had skin hives, 1 (3.1%) case had cough, and 4 (12.5%) cases had restlessness. No statistically significant difference in any of these complications between the two groups was observed (P < 0.05) [Table 4]. Mammillary mass reduction is operated for prohibition of malignant tumor spreading to other parts of the body. Ability of doing lumpectomy depends on the size and stage of tumor. Lumpectomy often done with local, regional, sedation, or general anesthesia. Nowadays, mammillary lumpectomy is an inseparable part of mammillary masses medical procedure in women. Regarding the surgery period, it is necessary to use drugs or their combinations that in addition to effective settlement of anxiety and pain in patient, duration the effects of these drugs is according to procedure period with least hemodynamic, mid-procedures and in recovery changes. The goal of this study was to determine if there a difference in the ketofol and fenofol on quality of sedation and analgesia in the lumpectomy. In the present study, the sedation level was significantly lower in the fenofol group than the ketofol group. The mean pain intensity was significantly lower in the PF group than the PK group. Several studies showed effectiveness of two-drug mixture of PK and PF in causing lenity and analgesia in middle of painful procedure including change of burning dress, primary orthopedic surgery, flexible fiberoptic bronchoscopy, alimentary system endoscopy, cardinal catheterization, bone marrow aspiration, and lumbar puncture. A number of studies showed that ketamine–propofol (ketofol) mixture is safe and effective for lenity. Mixing these two drugs leads to each one of their side effects alone and more quick recovery. Fentanyl can be used in mixture with propofol for pain settlement. Also, in mixing together, it has faster recovery time and less side effects. Theoretically, mixing ketamine and propofol like mixing fentanyl and propofol causes essential dose reduction in each of them. Akin et al. in a clinical trial study on 40 endometer biopsy candidates concluded that both mixture of PK and mixture of PF are safe, but using ketofol has more side effects and less patients' satisfaction. In a study by Kb et al. that was performed on 60 candidates of puerperal sterilization, they concluded that mixture of ketamine and propofol is safer and more healthy substitution from hemodynamic stability condition and respiratory depression, rather than PF. In the current study, that is parallel to two studies above, it can be concluded that lenity level in PK group is less than PF group meaningfully and average pain score in PK group is more than PF group. In another study in 2016 that was performed on 100 candidates of elective surgery, effectiveness of two-drug composition, PK and PF, was compared. This study shows that in anesthesia induction stage, PF composition leads to remarkable fall in pulse numbers and SBP and DBP in comparison to ketofol. In maintenance phase, PK causes more stable hemodynamic. In recovery phase, ventilation score in ketofol is better, while movement and awaking score in PF group is higher. In total, it has been concluded that both drug groups cause quick, enjoyable, and safe anesthesia with very less side effects and hemodynamic effects. In the current study, there was no significant difference in the average number of heartbeat, arterial saturated oxygen level and MAP during the study and also in recovery time in both groups that is parallel to the studies above. In this study, it has been also concluded that both groups cause quick, enjoyable, and safe anesthesia with very less hemodynamic effects. Totally, by considering recent studies and results of the current study, using propofol with other sedative drugs such as sufentanil and ketamine for painful methods is safe and effective. Furthermore, this study is the first report of comparing propofol-sufentanil and PK in mammillary lumpectomy candidates. Fassoulaki A, Melemeni A, Staikou C, Triga A, Sarantopoulos C. Acute postoperative pain predicts chronic pain and long-term analgesic requirements after breast surgery for cancer. Acta Anaesthesiol Belg 2008;59:241-8. Arora S. Combining ketamine and propofol (“ketofol”) for emergency department procedural sedation and analgesia: A review. West J Emerg Med 2008;9:20-3. Singh R, Ghazanwy M, Vajifdar H. A randomized controlled trial to compare fentanyl-propofol and ketamine-propofol combination for procedural sedation and analgesia in laparoscopic tubal ligation. Saudi J Anaesth 2013;7:24-8. Burton JH, Miner JR, Shipley ER, Strout TD, Becker C, Thode HC Jr., et al. Propofol for emergency department procedural sedation and analgesia: A tale of three centers. Acad Emerg Med 2006;13:24-30. Dunn T, Mossop D, Newton A, Gammon A. Propofol for procedural sedation in the emergency department. Emerg Med J 2007;24:459-61. Miner JR, Biros M, Krieg S, Johnson C, Heegaard W, Plummer D, et al. Randomized clinical trial of propofol versus methohexital for procedural sedation during fracture and dislocation reduction in the emergency department. Acad Emerg Med 2003;10:931-7. Akin A, Esmaoglu A, Guler G, Demircioglu R, Narin N, Boyaci A, et al. Propofol and propofol-ketamine in pediatric patients undergoing cardiac catheterization. Pediatr Cardiol 2005;26:553-7. Marx CM, Stein J, Tyler MK, Nieder ML, Shurin SB, Blumer JL, et al. Ketamine-midazolam versus meperidine-midazolam for painful procedures in pediatric oncology patients. J Clin Oncol 1997;15:94-102. Hashemi AS, Ayatolahi V, Ghilian R, Ghadami Yazdi A, Fadavi N, Yadegar Y, et al. Ketofol for bone marrow aspiration and lumbar puncture in children with ALL. Iran J Pediatr Hematol Oncol 2011;1:126-32. Aouad MT, Moussa AR, Dagher CM, Muwakkit SA, Jabbour-Khoury SI, Zbeidy RA, et al. Addition of ketamine to propofol for initiation of procedural anesthesia in children reduces propofol consumption and preserves hemodynamic stability. Acta Anaesthesiol Scand 2008;52:561-5. Stanley TH, Berman L, Green O, Robertson D. Plasma catecholamine and cortisol responses to fentanyl – Oxygen anesthesia for coronary-artery operations. Anesthesiology 1980;53:250-3. Hollman GA, Schultz MM, Eickhoff JC, Christenson DK. Propofol-fentanyl versus propofol alone for lumbar puncture sedation in children with acute hematologic malignancies: Propofol dosing and adverse events. Pediatr Crit Care Med 2008;9:616-22. Khutia SK, Mandal MC, Das S, Basu SR. Intravenous infusion of ketamine-propofol can be an alternative to intravenous infusion of fentanyl-propofol for deep sedation and analgesia in paediatric patients undergoing emergency short surgical procedures. Indian J Anaesth 2012;56:145-50. Akin A, Guler G, Esmaoglu A, Bedirli N, Boyaci A. A comparison of fentanyl-propofol with a ketamine-propofol combination for sedation during endometrial biopsy. J Clin Anesth 2005;17:187-90. Kb N, Cherian A, Balachander H, Kumar C Y. Comparison of propofol and ketamine versus propofol and fentanyl for puerperal sterilization, A randomized clinical trial. J Clin Diagn Res 2014;8:GC01-4.